The Sussex region provides many chances to see some great scenery on two wheels. Our 16 covered bridges, eight of which are within 10 minutes' drive of downtown Sussex, are especially suited for exploring by bicycle. What's the weather like in the Sussex area today? From Highway exit 195, turn east onto Route 890, putting the large cows on your right. Travel 1 km to the Salmon Covered Bridge, visible on your left. Park your vehicle and enjoy exploring one of the most picturesque bridges in the region. Then, grab your bike and turn left upon leaving the park. Take the Plumweseep Cross Road on your right, just meters from the covered bridge. Follow the crossroad for about 3 km to its end and turn right. Follow this road, another 1.5 km and across the railroad tracks, to the Plumweseep covered bridge. Afterwards, reverse your route to return to your vehicle. This makes a comfortable two-hour outing that's suitable for most fitness levels. Road surface is chipseal with no shoulders. For a longer ride to see an New Brunswick's second most famous covered bridge, start at Salmon Covered Bridge. Upon leaving the park, follow Rte. 890 10 miles to Newtown. Take the dirt Oldfields crossroad to the covered bridge. You can enjoy a break at the small park. The Oldfields covered bridge appeared on the Canadian quarter for New Brunswick in 1992. Go through the bridge and follow the crossroad to the Knightville Road, where you want to follow the signs to Sussex. About 1 km before the Knightville Road meets Rte. 890, you will see a sign pointing out the Plumweseep Road on your left. Follow this new road to the Plumweseep covered bridge. Then, reverse your direction and take the Plumweseep crossroad on your left after crossing the railroad tracks. Follow the crossroad to Rte. 890, where you turn left and return to Salmon covered bridge park and your vehicle. This ride makes for a leisurely morning or afternoon run with some hills. Road surface is chipseal with no shoulders. Cyclists touring on Rte 10 or the Trans Canada Highway will find a warm welcome when they stop at the Covered Bridge Visitor Information Centre at Youngs Cove, May 1 to Thanksgiving Weekend. Enjoy the uniquely shaped structure, while taking a break from the saddle. The Canadian outdoor adventure magazine, Explore, lists Sussex in its March 2007 edition as one of Canada's top 10 communities for enjoying outdoor sports year round. We are proud to share this list with other Canadian iconic places like Jasper, Alberta! 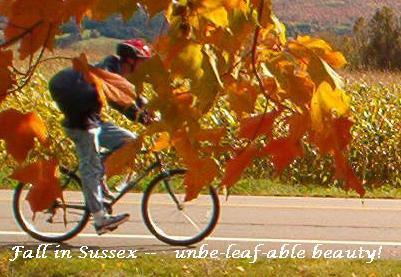 Check out the downloads page on this web site for directions for several self-directed bicycle tours of the Sussex region. Velo NB is also developing a list of some great rides in the area and other parts of New Brunswick. Mountain bikers can enjoy an excellent five-kilometre loop with plenty of up and down fare near the top of Poley Mountain, Waterford. Main Street in the town of Sussex is a flat, four-km route. Commuters will enjoy wide lanes between Sussex Corner and the downtown shopping area. Those who wish to avoid traffic all together may want to use the scenic community trails that run parallel to Main Street. You can enter the west end of the trails at Maple Avenue (near the post office) or Leonard Drive (across from the 8th Hussars Sports Centre). Those entering from the east may do so at Sullivan Park (look for the outdoor skating rink), Post Road, Sussex Corner. NOTE: Stay safe while enjoying the Sussex area on your bike! Provincial law requires all cyclists on public roads to wear a helmet while riding. All vehicles, including bicycles, are to travel in the same direction. Cyclists are asked to refrain from riding on sidewalks or against traffic for their safety. Vanwell Publishing Ltd., which describes off-road mountain bike trails . The Kings County Wheelers conduct weekly road rides on Monday and Wednesday evenings, starting at 6:30 pm from Broadway Cafe, Broad Street, Sussex. Monday night is a great chance for beginners to come out, while it's time to pick up the pace on Wednesday evenings! Thursday evenings are for mountain bike rides, heading out from the Sussex Corner outdoor rink, Post Road, at 6:30 pm. Contact Brian Fulford at (506) 433-6971 for more information.